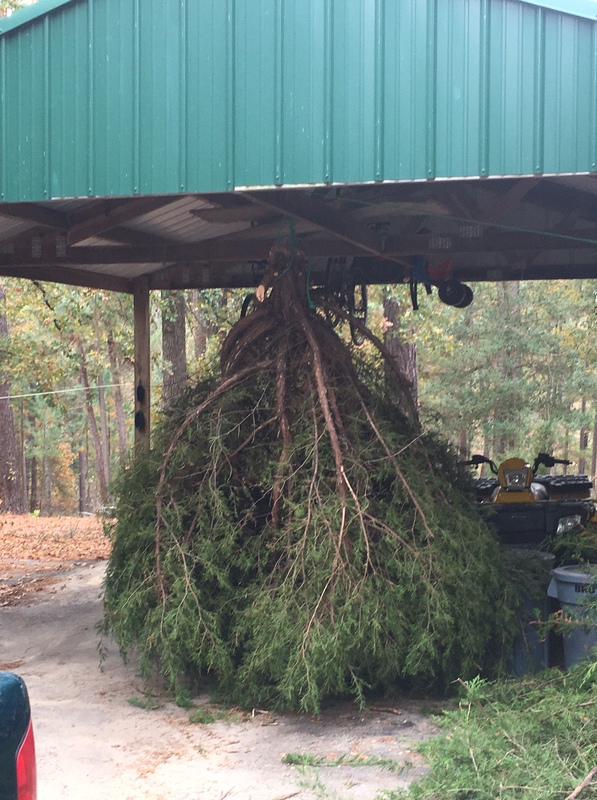 This is the story of our 2016 Christmas tree. It took a while for me to be able to tell you this story because it kept evolving. Our tree has transitioned over the last several week through many phases. But now I believe he is complete, and I’ve been able to fully embrace and accept that this IS my very crazy and a bit ridiculous Christmas tree. 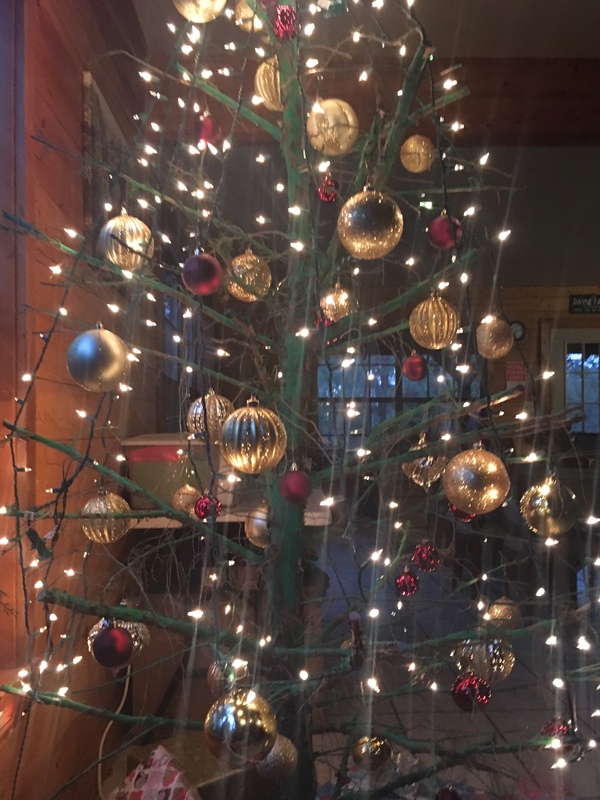 If you need to be caught up, we have a tradition of ve ry odd trees and tree selection. 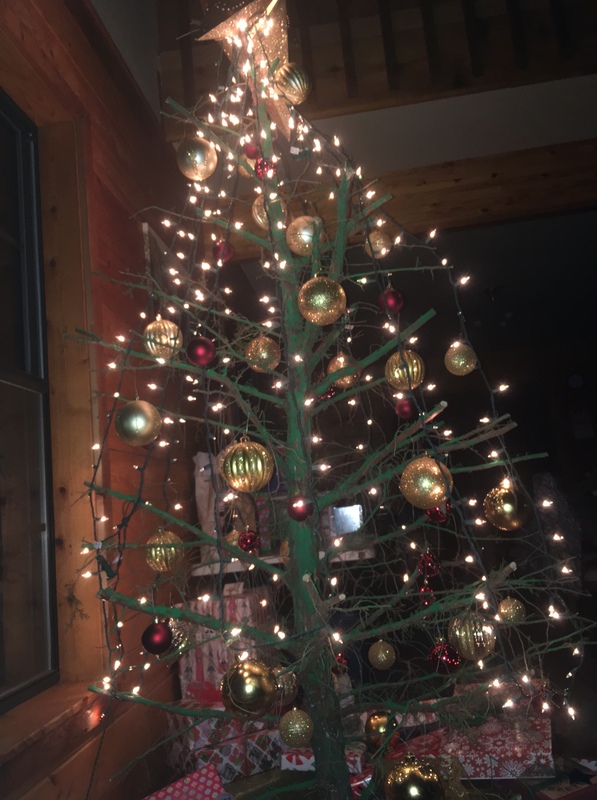 Read about previous trees here and how my family likes weird Christmas trees. 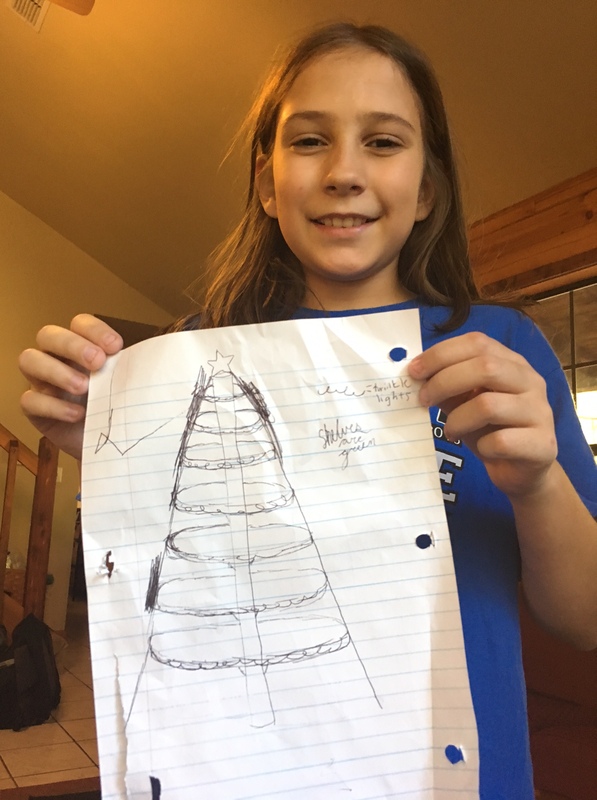 This year’s events started back before Thanksgiving with Lydia campaigning for a Christmas tree built of shelves. She’s adorable, but she couldn’t really convince anyone but maybe her daddy. So we moved on. The day after Thanksgiving, Nathan took us all out to look for a tree. Somehow we came back with this. It hung in the carpo rt so Nathan could “do some trimming”. He envisioned hanging it upside down in the house. There was also talk of it spinning on a motor. I can’t even. It sounded like a lofty goal for a giant and super ugly tree. It hung here several days while I parked elsewhere. And then I said Please take this tree away. There is no hope for it in my life. 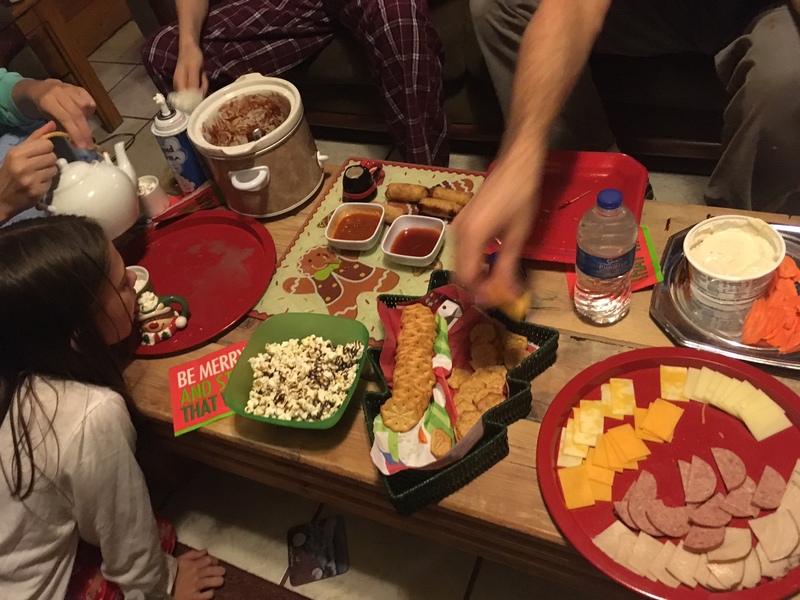 Remember that one of our Christmas tree rules is that mom has veto power. One evening in a desperate attempt to just get some sorta tree going in our house, Abby sent the boys out to just get a regular-ish looking tree that was near the front gate of our driveway. They went, in the dark, and came back with this. I need you to understand that just to the right of the tree, being completely hidden, is our piano. This tree was much bigger, much WIDER than our piano. About 8 feet wide to be exact. Abby said that it looked much bigger than she was remembering. 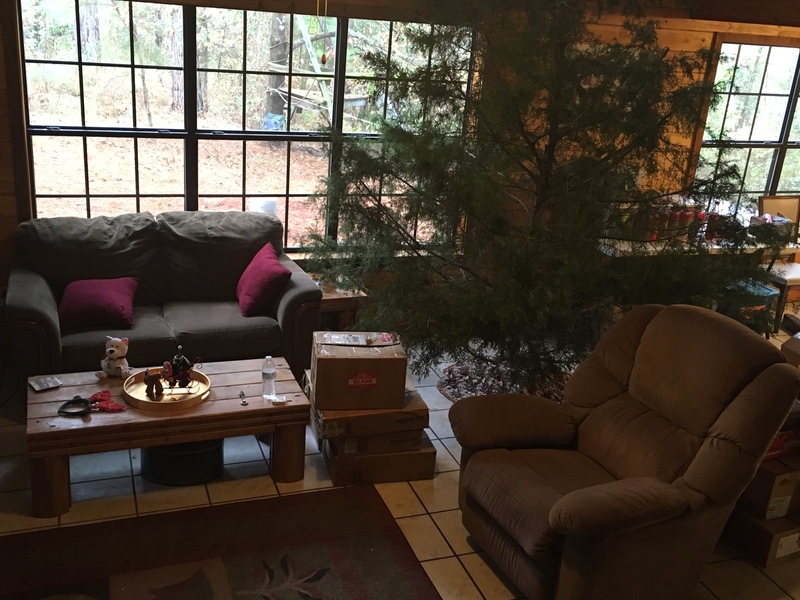 We rearranged the whole living room to accommodate this ginormous tree. We let Sam do some trimming, which ended up being pretty bad. This tree was going from worse to worser. 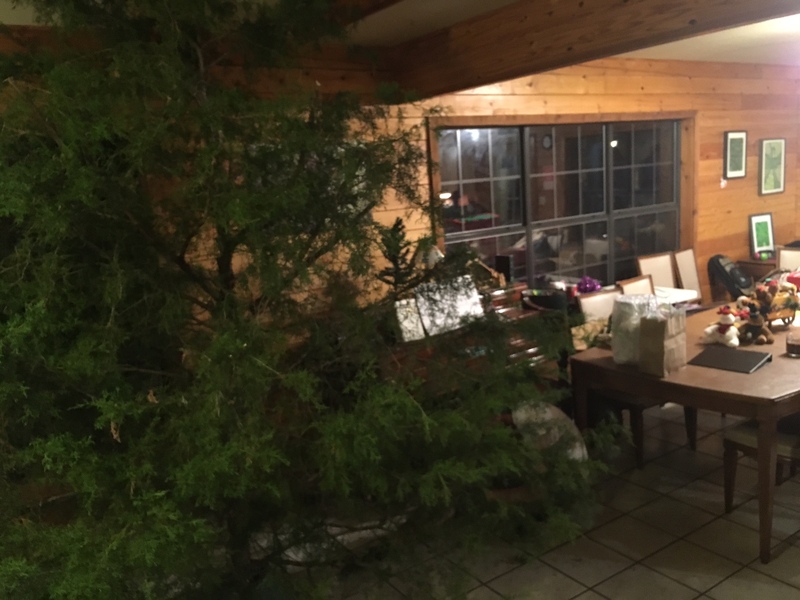 Sidenote- the day after bringing this tree inside, we drove in the driveway and Abby said, “Hey guys, THAT was the tree I was talking about.” Yea, it was still planted firmly in the ground. A few evenings later after staring at this thing for a while, I made a special “dinner ’round the coffee table” to get everyone excited about decorating this tree. That ended up being super fun, but in the end no one decorated the tree. At all. Still boxes piled everywhere and a naked tree. It’s like no one even knew what to do with this thing. And then the real crazy started. While I was gone one evening with Sam and Abby, Nathan and Lydia cut all the greenery off the tree. All. The. Greenery. Yes, that’s what I said. 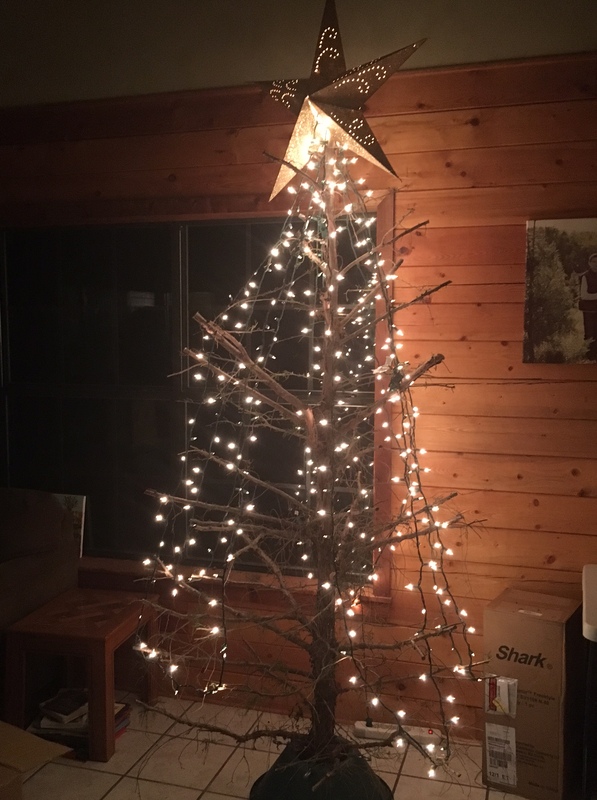 They added our HUGE and very non-proportional star to the top and let some lights hang down. I came home to find this. So yea. In the daylight, it looked much worse. They named it Esqueleto. This means skeleton in Spanish, but is also a reference to the movie Nacho Libre. At this point, I was a little perplexed. But they were wearing me down. 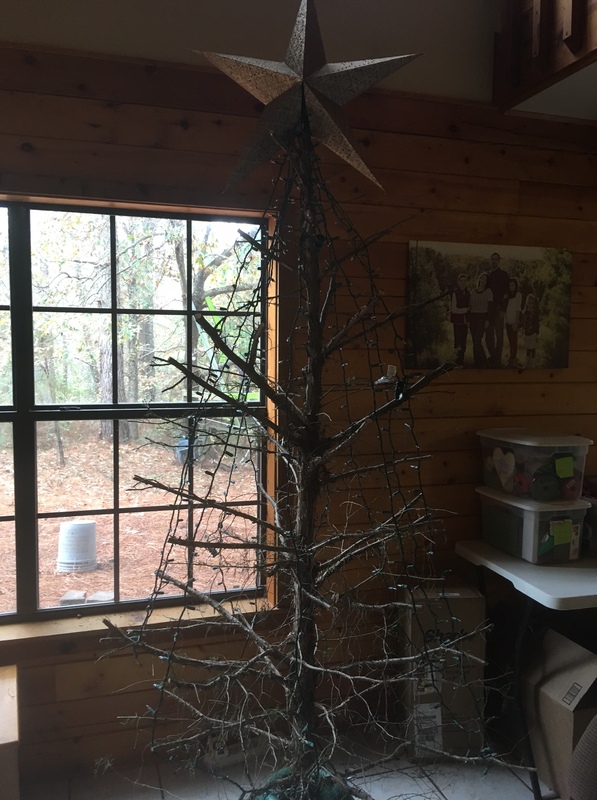 I couldn’t imagine after allwe’d been through having to start over with a new tree. So I decided to play their game. While everyone was at school, I painted the tree green. And then the next day, I hung only the gold and maroon balls on it. I put all the rest of the ornaments and boxes back in the closet so that no one could get to them. There just didn’t seem to be a place for them with this tree. And so in t he end, we got this. I sit and write you from beside the light of this strange, minimalist, unusual tree. It’s not what I would have ever chosen. It took me a while to be okay with it at all. But it’s the story of how my family works. There are some social norms about appearances, how things “should” be, and conforming to certain standards that are just really not important. Sometimes my family really challenges me and reminds me of this. Life is more fun if you can just relax, and especially around the holidays. 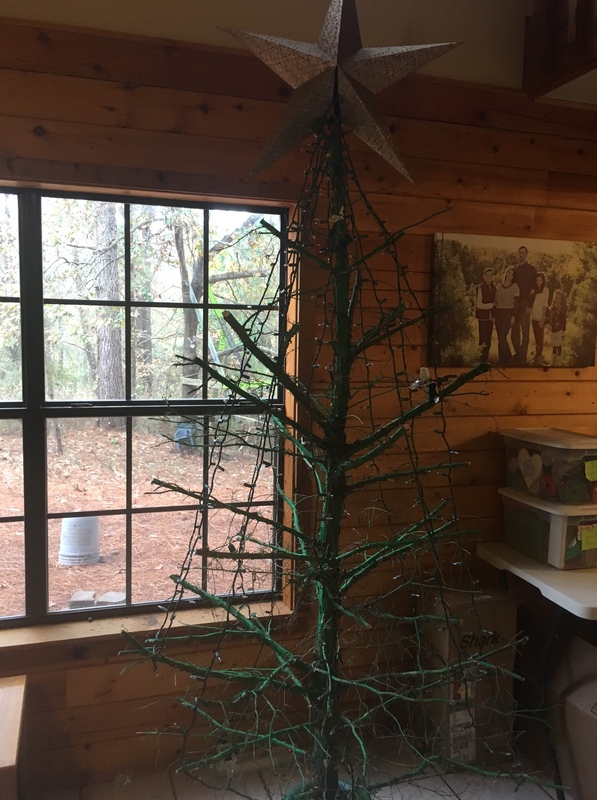 Even if it means having a Christmas tree that is only bare branches. Merry Christmas from Esqueleto and the Payne family.